With DreamCloud, you would never have this experience. We are a company founded in innovation and technology. We are proud of our efficiency and innovation which includes not using middleman or having stores so that we can pass the savings on to our customers. Due to our quality construction and use of premium materials in all four layers, we can achieve the best of both worlds in hybrid and memory foam mattress. Patent-pending 5 zone DreamCoil coils which have been patented to be the perfect amount of support and spring.While Beautyrest Black claims to offer a luxury mattress, they do not use the same first-class construction and luxury materials as DreamCloud. For example, Beautyrest Black uses a cover with Polyester and Tencel, vs. DreamCloud using a hand-tufted Cashmere Blend cover. Yes, Tencel is cooling, but we built cooling gels right into our mattress system so you can enjoy the plush Cashmere Blend cover and still stay cool – without itchy polyester! In fact many of our customer’s find that the Cashmere Blend cover is so soft, they wish they could sleep directly on the mattress! Customers and third-party reviewers alike agree that DreamCloud floats at the intersection of sumptuous and luscious. According to sleepsherpa.com, “TRUETUFTED™ Cashmere Blend TOP [lets you] Dream your best life! DreamCloud’s Cashmere Blend cover provides unmatched breathability, premium softness and is naturally resistant to bedbugs.” DreamCloud uses the highest quality foams, second to none, to create a place where 8 layers of foam meet coil and gently lapses into a deep deep sleep. Beautyrest Black does not use the same layers of supportive foam, nor our patent-pending 5 zone DreamCoil coils which have been patented to be the perfect amount of support and spring. DreamCloud truly is the only mattress where ever feature ever dreamt has been crafted to transport you to the sleep of your dreams. Night after night after night. DreamCloud uses cutting-edge technology and premium materials to create the best support for your spine.The only affordable super luxury mattress to provide ultimate support and comfort, DreamCloud uses cutting-edge technology and premium materials to create the best support for your spine. Our soft Cashmere Blend, high density foams, reinforced edges, and encased coils allow you to experience the best sleep ever. Our plush euro top serves as a contouring pillow that cradles the body and includes the Cashmere Blend cover, top memory foam layer and the latex layers. Our reinforced sidewalls provide unmatched edge support for perfected sleep quality from edge to edge. Beautyrest Black does not use the same reinforced sidewall support meaning that you won’t get the same level of durability – which is why DreamCloud is guaranteed to last for Everlong instead of Beautyrest Black’s 10 years which is when their full warranty ends. With DreamCloud reinforced edges you will find that the side wall will not get blown out, and our weight limit can accommodate all types of sleepers with plush comfort and stable support. 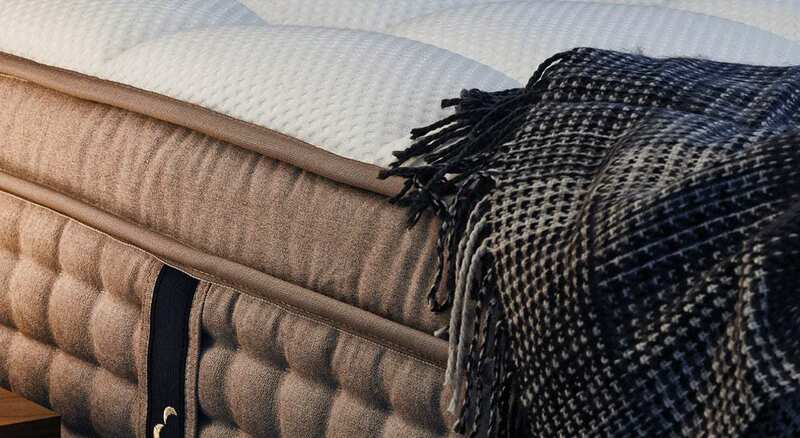 Our hand-tufted Cashmere Blend cover is hypoallergenic and naturally bed-bug resistant due to using premium foams and natural latex layer are rigorously tested to ensure their quality and safety for your ultimate comfort. Beautyrest Black only offers a 10 year warranty vs. DreamCloud’s Everlong warranty. DreamCloud offers a 365 day trial period, with free shipping and returns so you can try the mattress on your terms, for up to a full year. Beautyrest Black does not offer a trial period. You can only test Beautyrest Black in a retail store, which is an ineffective way to test your mattress. Studies show that it takes the body up to 6-8 weeks to adjust to a new mattresses, which means you just can’t tell in a 10 minute test of laying down on a mattress in a retail store. DreamCloud knows that, which is why we offer a full risk-free 365 night trial period so you can sleep in all four seasons to make sure DreamCloud is right for you. Without a trial period, Beautyrest Black is asking you to make a large financial commitment to a mattress you just won’t be able to accurately test for your body. DreamCloud offers support and perfect alignment for your spine from the first night, and if for some reason it’s not ideal for you, you can send it back at no cost. So Disappointed! Worst sleep ever!! I purchased the Black Ice Natasha with such high expectations. I had never spent so much money on a mattress before and it felt super comfortable in the store. Now 5 months later – i hate it more everyday. It completely sinks when you lay on it and I am not a large person. I wake up every morning with a horrible backache. Wish I bought a mattress from an online company that offers 100 days or more to return the item. DreamCloud customers love that they can test the mattress for a full year in order to make sure it’s the perfect supportive mattress for their sleep. DreamCloud matches Beautyrest Black 15” mattress with our own combination of luxury materials to provide plush, supreme comfort. However, with Beautyrest Black you don’t get a better mattress in fact you will pay over 3x more for a mattress that does not use the same high level of materials such as hand tufted Cashmere Blend cover and our patented coils. As sleepsherpa.com says about DreamCloud, “Although these mattresses are a little more expensive compared to others on this site, they are nowhere near the astronomical prices of other brands such as Duxiana and Kluft and Aireloom which can easily exceed, $10,000 for a mattress. I have tried some of these mattresses and although they are well made, the markups are astronomical and I think you will find some of these mattresses just as comfortable.” Beautyrest Black has not been proven to be more comfortable nor do they use higher quality memory foam than DreamCloud. We work to ensure that our memory foam and 8-layer system is the best in the industry. When deciding between DreamCloud and Beautyrest Black, you won’t regret choosing the Plush Life.